The only problem with collecting vintage revolvers is the need to not inflict too much wear and tear on the grand old shooters. Regardless of the quality of the four screw S&W Model 19 or the pre-war (WWII) S&W Heavy Duty revolver I just don't like running a box (or more) of fire breathing loads through them. Yes they are very well made revolvers, but they are also fifty, sixty eighty and ninety year old handguns. A few months ago I realized that I've ended up with a bunch of revolvers that I am very proud of, but that I also treat with kid gloves. Sometimes you just have to have a shooter. I realized that meant I had to buy a modern high-quality revolver. A new new revolver. 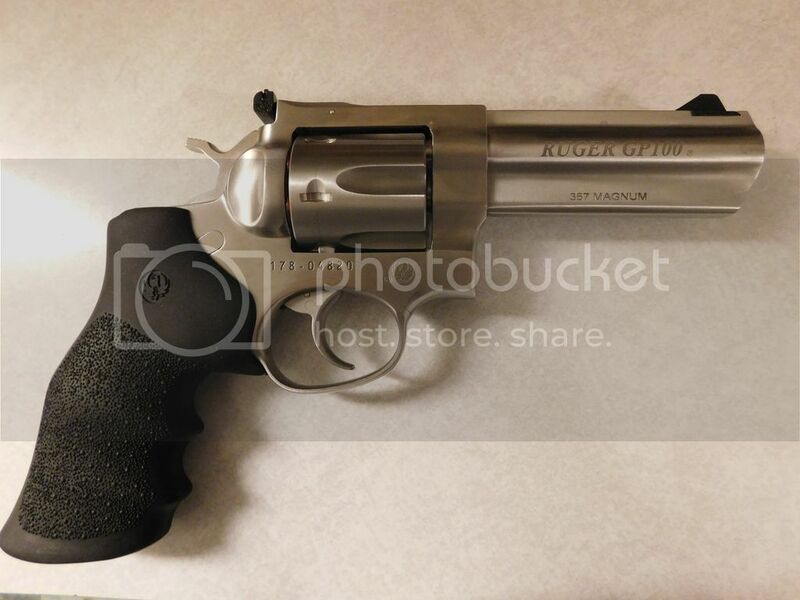 So today I withdrew some cash from my savings account (also known as my Toy Account) went to the local Sportsman's Warehouse and purchased a brand-new stainless steel Ruger GP-100. Thought about buying a Smith & Wesson, but Ruger makes a strong, reliable, no frills revolver and that's what I've been needing. 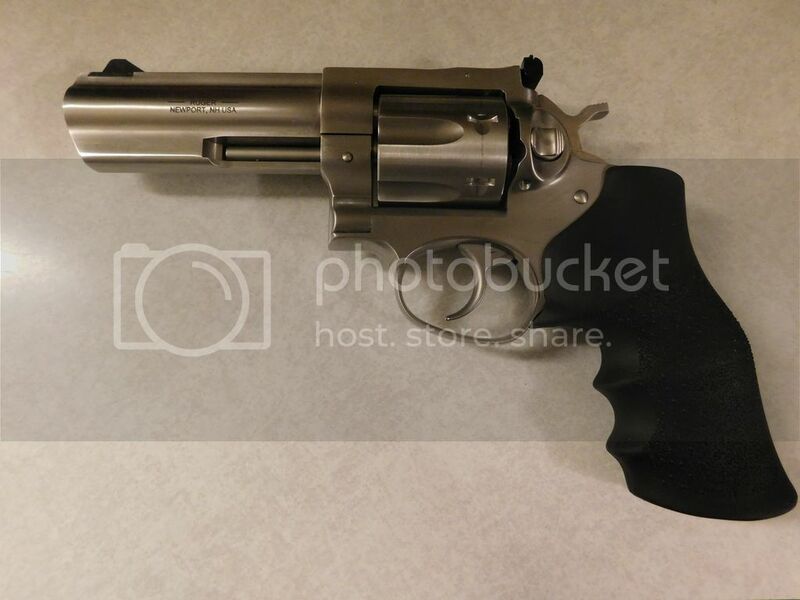 So $700.00 later I now own a workhorse revolver. Now this I can shoot without feeling guilty because this sucker is designed to be used and used hard. My hothouse revolvers will just have to adjust. Last edited by Jcordell; 12-04-2016 at 04:07 PM. I've got the same thing, but blued. I love it. If you're out of ammo, you can throttle someone with the beast. My only complaint is that mine is a very early version, so it's really hard to put Hogue grips on it. Yeah I'm going to put Pachmayrs on it. Doesn't mean anything though. I've always preferred Pachmayr grips. Dad always used Pachmayr products and when I started shooting it was Pachmayr that I started with. I wanted to put on new grips, but I have to stick with the factory one, which aren't bad. I also swapped out the springs so I get a lighter DA trigger pull. It's interesting to look at some of the responses that I've gotten from folks on a couple other forums. Some posters understand exactly where I'm coming from while there are those who seem to take it as a personal insult that I want to go easy on my older revolvers - even the ones from the seventies. Different strokes for different folks I guess. Totally makes sense to me - there's a reason my Artillery Luger and C/96 stay in the safe but my Hi Power comes every time. I actually don't mind the GP100s, they're not nearly as nice as a Smith buy they're built like a bank vault and that has its own kind of charm. Besides, there's nothing wrong with just wanting something a little different - I occasionally toy with the idea of buying a Glock. I've been tossing around the idea of buying a 4" GP100 stainless for several years. Everytime I have the money something neat comes along. This time I finally just went and got the money and drove to Sportsman's. Well that's not totally true. I did stop at a couple of my favorite LSG's, but they didn't have anything for once. So I was destined to buy it. You're right it does have it's own kind of charm with it's vault like physique. You should go crazy and buy a Glock. Truth be told I like my G19. When I retire from my agency it will be gifted to me and I'm okay with that. Don't feel the need for more Glocks, but I like the one I carry. Seconded almost entirely. Only hitch is the part about the Glock, which I'd even also agree with if I could find one that actually felt comfortable in my hands. But 'something different sometimes' point I hear absolutely. Otherwise spot-on - S&W man though I be I like Rugers a lot also (little more partial to the older Six series, but still), and I'm with ya entirely on your point JCordell. I'd say take the oldies but goodies out for fun once in a while but serious shooting, well, you got it - get a 'daily driver' piece. And you certainly got a good a one. Last edited by Jcordell; 12-10-2016 at 03:29 PM.